The Adventure of Parenthood: Day 10 & 12 - Anything for a quiet night. Old theories on parenting dictated that fresh air helped children to sleep well at night. Since Dylan was born, I can count the number of days we have stayed in the house on one hand. I am not one to sit at home all day when there is coffee to be drunk, clothes to be bought and friends to be seen. Dylan definitely gets his fair share of fresh air, and maybe this is a contributing factor to him sleeping (mostly) well. Day 10's activity is not worthy of a whole blog entry, and luckily there were no cameras to capture the moment. I thought I would give running with the buggy a go, so down to the seafront we went, Dylan wrapped up and strapped in, me apprehensive and in trainers. Short story shorter, Dylan did not seemed bothered in the slightest that I was huffing and puffing and pushing all twenty pounds of him along, and I was a little too bothered. It is an experience I am unlikely to repeat. Day 12 was more eventful. 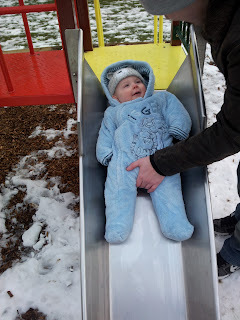 We took Dylan to the park, and for once he was still awake when we got there! He has an unfortunate ability to fall asleep at the crucial moment, usually just as the park is in sight. On Sunday he managed to stay awake all the way there, and long enough to play! Parks are vital to society as a playground for the young, and commonly a place to hang out for teens, and the brilliance is that they are always free and always open. I intend to utilise them a great deal as Dylan grows up! We tried the seesaw, the slide, the flat net swing, and the baby swings. The bloke pushed the baby so high in the swing, but still all we got was smiles. The seesaw didn't balance but still all we got was smiles. We pushed him down the slide on his own but still all we got was smiles. I think he liked the park. And did he sleep well both nights? He certainly did! There must be some truth in it then. Thanks for reading! 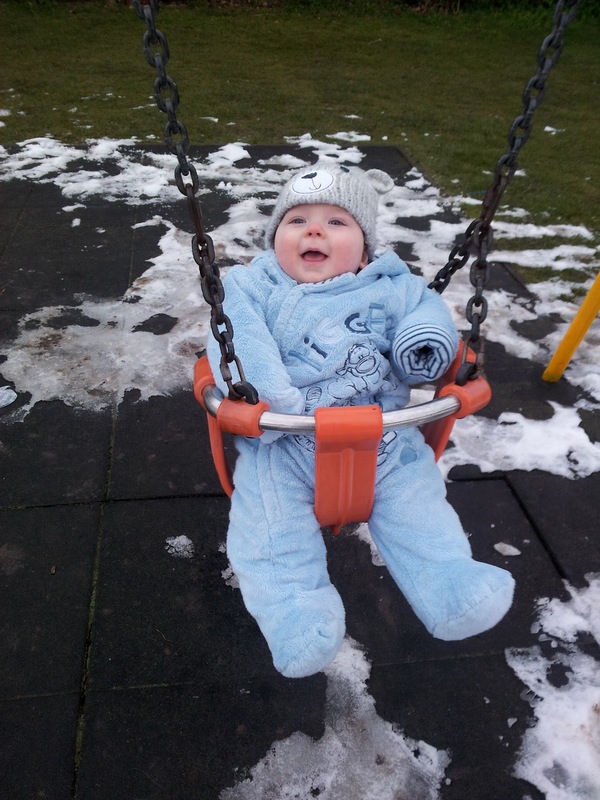 His snowsuit here is from Matalan I believe, their Disney range. Hope your little one gets better soon!